Under-Secretary-General for Peacekeeping Operations Hervé Ladsous briefs the press in New York At left is UN Spokesperson Stéphane Dujarric. The United Nations peacekeeping chief today announced that following reports of alleged sexual exploitation and abuse, seven peacekeepers serving with the UN mission in the Central African Republic (CAR) have been repatriated, while nine have had their payments suspended. “There have been since the mission started last year 63 allegations of possible misconduct,” Under-Secretary-General for Peacekeeping Operations Hervé Ladsous told a press briefing in New York following a four-day visit to CAR. In addition to meeting with Government officials and well as average citizens during his visit to the country, Mr. Ladsous met with personnel of the UN Multidimensional Integrated Stabilization Mission in CAR (MINUSCA) and discussed the fight against sexual exploitation and abuse, in the wake of recent allegations. He reported today that following one of the latest allegations involving a peacekeeper from the Democratic Republic of the Congo, the UN asked the country’s authorities to send national investigators. The investigation reportedly took place and the UN is awaiting its conclusions. 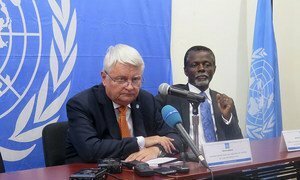 “Fifteen cases is definitely 15 cases too much, and I had a long meeting with uniformed personnel in Bangui, I gave them a very, very, strong worded speech based, of course, on what the Secretary-General himself had said when the problem surfaced,” Mr. Ladsous stressed. A meeting will soon take place at UN Headquarters with troop- and police-contributing countries during which Secretary-General Ban Ki-moon will outline priorities to be achieved with their support. Mr. Ladsous said he and the Under-Secretary-General for Field Support, Atul Khare, submitted a list of 40 proposals to Mr. Ban ten days ago. Meanwhile, insisting that there is no excuse for misconduct, the peacekeeping chief also highlighted the very difficult living conditions under which UN personnel are living, especially in some of CAR’s provinces. He added that the UN is looking at ways and means to offer peacekeepers “relatively cheap [rest and recuperation] trips,” but that it would be difficult as the capital, Bangui, has a very poorly served airport with only one or two flights a day. Mr. Ladsous once again reiterated that sexual abuse and exploitation is unacceptable. “It simply reflects on the United Nations, it reflects on the trust that people should feel for us and that we are, in a way, betraying,” he said. Regarding the political situation in the country, the Under-Secretary-General insisted that elections in CAR should take place this year “in good time” as the second transitional government ends on 31 December, and there would be no third one. The United Nations has established a weapons-free zone in the town of Bambari in the Central African Republic (CAR), the world body’s peacekeeping chief announced today at the end of a four-day visit to the country.